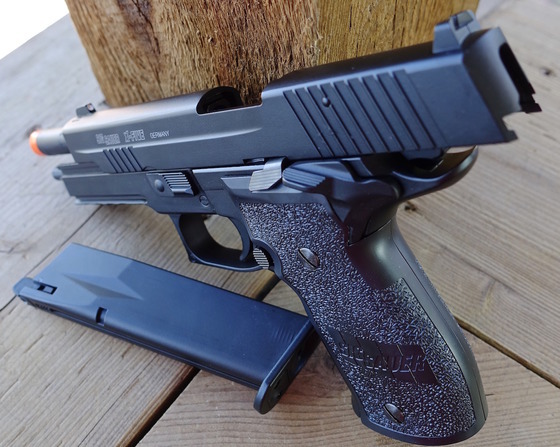 In yet another Field Test Shooting Review I test out an Cybergun distributed KWC made CO2 powered Blowback 6mm Plastic BB shooting Sig Sauer P226 X-Five Pistol. I have already done some table top Reviews for a few other versions of this same KWC made pistol... The 4.5mm Steel BB shooting version of this same Cybergun distributed pistol and also the KWC unlicensed version in Airsoft and with some slightly different cosmetics. Getting to the Field Test shooting portion of this review. I performed my standard five round Chronograph velocity fps test using .20 gram plastic Airsoft BB's with a brand new 12 gram CO2. The fastest Airsoft BB achieved by the Cybergun KWC Sig Sauer P226 X-Five CO2 Blowback Airsoft Pistol was 327 fps and the slowest came in at 298 fps with a five shot average of 312 fps, that might seem low but in terms of a close range Airsoft gun this is ideal. I shot 10 rounds through my Cybergun KWC Sig Sauer P226 X-Five CO2 Blowback Airsoft Pistol and they all easily found their mark close together on the paper target, 8 of the 10 shots grouped within a 3/4 inch hole with 2 shots coming out juts a bit extending the grouping to about 2-3 inches. With light Airsoft BB's some shots will stray a little bit but the fact that 8 out of the 10 shots pretty much made one small hole shows that this Blowback Airsoft Pistol is very accurate to say the least. The Cybergun KWC Sig Sauer P226 X-Five CO2 Blowback Airsoft Pistol has an awesome single action trigger, if your not ready for it it can almost get away on you but after a couple of shots you will easily figure out the break and release points and be hitting targets down range with ease from this super short and light trigger. 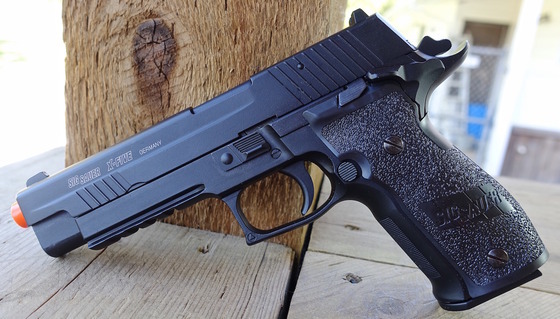 The Cybergun KWC Sig Sauer P226 X-Five CO2 Blowback Airsoft Pistol does also have a double action trigger if you decide to lower the hammer but need to take a quick shot. The Blowback action is one of the heavier blowback actions you will find on an CO2 Blowback airgun and the gun itself is fairly large and a bit on the heavy side but at the same time really well balanced and a joy to shoot.